As extreme temperatures, the rate of sea ice melt, the collapse of Greenland glaciers, the thawing of Siberian and Canadian permafrost and increased evaporation in the Arctic drive cold snow storms into Europe and North America, and as hurricanes and wild fires affect tropical and semi-tropical parts of the globe, it is becoming clear Earth is entering a shift in state of the atmosphere-ocean system associated with destructive climate tipping points. As Arctic permafrost is thawing an analogy with geological methane-release events such as the 56 million years-old Paleocene-Eocene boundary thermal maximum (PETM) event is becoming more likely. Such abrupt changes are occurring at present. 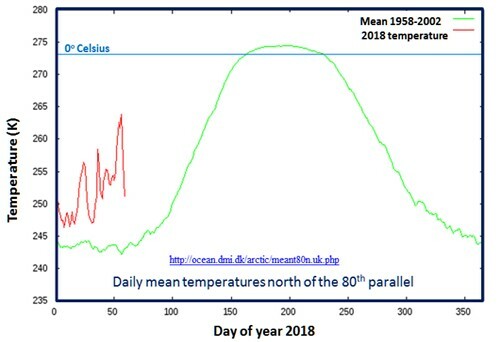 As mean global temperature has exceeded 1.2 degrees Celsius above 1880 temperatures (Figure 1), sharp reductions occur in Arctic sea ice from 45 percent in 1985 to 21 percent in 2017, when the ice cover was 8.5 percent lower than the average of 1981-2010. As the ice melts the near-total reflection (high albedo) of solar radiation from the ice is replaced by absorption of infrared radiation by open water; The flow of ice-melt water from the Greenland glaciers creates a large pool of cold water in the North Atlantic Ocean. The cold water region south of Greenland slows-down to aborts northward flow of the thermohaline Atlantic Meridional Ocean Circulation (AMOC), leading to cooling of the North Atlantic and adjacent North America and Europe. Rising temperature and evaporation over the warming Arctic Ocean results in build-up of masses of cold vapor-laden air, intermittently penetrating into lower latitudes through the weakened undulating boundary of the high-altitude polar vortex, which allows penetration of snow storms southward through Siberia and North America (Figure 2). 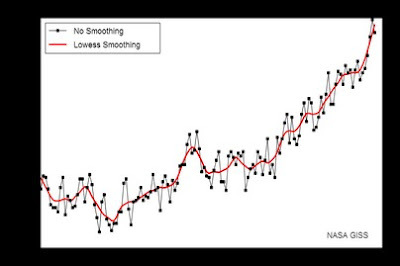 The slow-down to collapse of the northward flow of warm water from tropical regions, namely the Atlantic Meridional Ocean Circulation (AMOC), originating from the Gulf of Mexico, and further warming of the tropical ocean pools, produce in temperature polarities with cool northern ocean regions. This ensues in storms and hurricanes in regions such as the Caribbean islands. Warming of the west Pacific Ocean leads to cyclones such as have affected the Philippines, Fiji and Samoa. 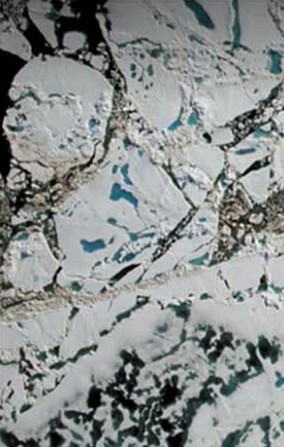 Polar warming is leading to the release of large amounts of methane from frozen organic matter stored in the permafrost and from methane hydrates in lakes, the sea and sediments. This has already raised atmospheric methane levels during 1960-2017 from ~1600 parts per billion to 1860 ppb. The bubbling of methane is locally leading to collapse and cratering of the permafrost. The total mass of methane on land of ~2050 GtC (billion tons) and methane hydrates at sea of ~16,000 GtC (Global Carbon Project) is some 30 times greater than the >600 GtC which has been produced by anthropogenic emissions since the onset of the industrial age. Even a release of 10 percent of Arctic-stored carbon would raise atmospheric greenhouse levels by a factor of about three.